The fact that American cinema hasn&#146;t quite hit rock-bottom doesn&#146;t stop our directors from trying to get there, and the latest diving bell is Christopher McQuarrie&#146;s directorial debut The Way of the Gun. A threepenny opera of lurid plot turns, oceanic bloodletting, and pseudo-existential dialogue, Way is a late entry in the cycle of Tarantino-influenced crime flicks that came out in the years following Reservoir Dogs. 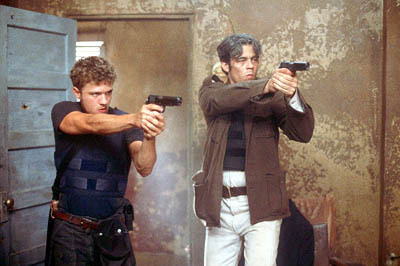 Ryan Phillippe and Benicio Del Toro star as Parker and Longbaugh, two scuzzy partners-in-psychosis who are facing a dead end in their lives. When they catch wind of a rich couple who&#146;ve paid a young woman (Juliette Lewis) to act as surrogate mother for the baby they can&#146;t have, the thugs don&#146;t hesitate to jump at the big score. They kidnap the heavily pregnant Robin, stash her in a motel on the Mexican side of the border, and hit up the Chidducks with a $15 million dollar ransom demand for the unborn child. Mr. Chidduck (Scott Wilson), who&#146;s no straight arrow himself, dispatches two bodyguards to rectify the situation, and he also unleashes his secret weapon: Sarno (James Caan), a polished fixer who&#146;s equally capable of talking to the gangsters in their own language and blowing them away. The Way of the Gun bides its time until its Grand Guignol finale with gales of philosophical maundering. Parker&#146;s voiceover narration is bad enough but even the regular dialogue is riddled with such insights as, "Karma is justice without satisfaction." McQuarrie is trying to make a statement about alienation &#150; that pet theme of artists who don&#146;t have anything else to talk about &#150; but his technique is about as subtle as a shotgun blast. Way&#146;s idea of poetry is to turn the rules of Hearts into a metaphor for loneliness, and in the cinematic equivalent of stuttering it includes scene after scene of characters failing to reach each other on their cell phones. Every so often McQuarrie backs up a dump-truck and unloads some new plot twist into the landfill of his story, until by the end it&#146;s turned out that nearly everyone in the picture is related to someone else. But these revelations aren&#146;t surprising (I guessed the last two long before they occurred) and, worse, they don&#146;t deepen anything that&#146;s come before. They&#146;re twists for twists&#146; sake. Del Toro and Phillippe have a quietly effective chemistry in the rare moments that the story relaxes enough to let them come through. The early scene in which they first hear of the surrogate mother, and instantly hatch a scheme to grab her, is the movie&#146;s one small treasure: in the course of a phone call they happen to overhear while seated in a waiting room, they move from passive absorption in their magazines to purposeful intent without a word passing between them. For some sad reason Del Toro, normally one of Hollywood&#146;s most hilariously idiosyncratic actors, has been remade into a Brad Pitt clone &#150; even his haircut and posture suggest Pitt. Juliette Lewis, perhaps mindful of the way she alienated her one-time fans with her uncontrolled tics and grimaces, gives such a carefully bland performance that she seems to be on parole for something. As one of the bodyguards, Taye Diggs gets to use only a fraction of the charisma he zapped us with when he swept through that curtain in Go. The one cast member who consistently makes his presence felt is Caan, who presumably can play aging samurais in his sleep. As it turns out, McQuarrie&#146;s movie isn&#146;t a movie at all, but rather some kind of message. In recent interviews he&#146;s said that The Way of the Gun was his answer to the film executives who wouldn&#146;t greenlight his pet projects after he won an Oscar for writing The Usual Suspects. But it isn&#146;t the suits who have to abide McQuarrie&#146;s stubborn refusal to provide a believable character or an involving plot, or who have to wade through the buckets of gore at the end, or who have to figure out what &#150; if anything &#150; the whole thing means. McQuarrie may think he’s flipping off the studio heads, but it’s his audience that’s getting the finger.